The 1oz Panda Coin was first introduced in 1982 by the People’s Republic of China and has since gone on to be one of the premier gold bullion coins on the world market. 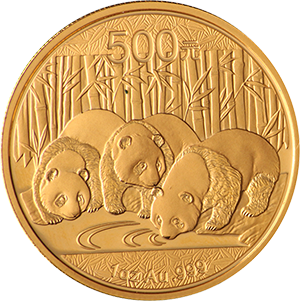 The largest weight and nomination of the series, the 1oz Panda coin is the most popular and valuable of the series. The Panda coin design changes every year, one of only two major mints in the world that annually redesign the inverse of the coin, the other being the Australian Nugget. The only years in which the Panda’s design remained unchanged was 2001 and 2002, but annual changes were quickly reintroduced after complaints. The changes in design make the Panda coin particularly popular with collectors, who often endeavour to collect the entire set. The Panda is available in several weights, 1/20oz, which was introduced in 1983, 1/10oz, 1/4oz, 1/2oz and 1oz. Larger coins weighing 5oz and 12oz were released sporadically and have since become valuable collector’s items. The 1oz Panda Coin had a face value of 100 Yuan between he years of 1982 and 2000. This changed to 500 Yuan from 2001 until the present day. The total weight of the 1oz Panda Coin is 31.103g and it has a thickness of 2.70mm. It’s diameter measures 32.05mm. At 24 carats, it is also one of the very purest gold coins in the world. As is the case with such fine gold, they do require extra care when handling due to their malleability. 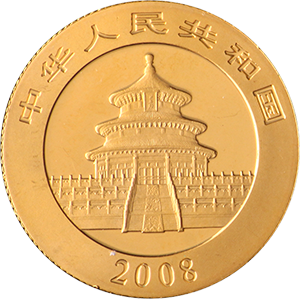 The obverse has remained the same throughout the coin’s history, depicting the Temple of Heaven and the words “Zhonghua Renmin Gongheguo”, which translates to The People’s Republic of China. 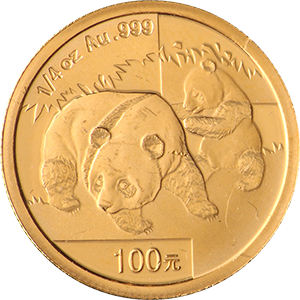 The coin’s inverse is always a depiction of the Giant Panda. It is these portraits that are changed annually. There are also Silver Panda coins of different weights released annually.